School sores or impetigo is a skin infection mostly seen in children. Here we focus on school sore treatment and how to reduce its spread. School sores, also known as impetigo, is a skin infection, as it predominantly affects school-age children. Being easily spread, the infection is caused by Staphylococcus and Streptococcus bacteria. It is more common in the summer. The condition usually appears as red sores on the nose and mouth (see the picture). These will eventually burst and develop an orange/yellow-colored crust. The time span between catching an infection and the appearance of symptoms is known as the incubation period. With impetigo, the incubation period usually lasts 1-3 days for Streptococcal infections and 10 days for Staphylococcal infections. These blisters will then burst and leak a sticky yellowish fluid. This crust will eventually scab and fall off. The skin will heal completely after a few days. Doctors can usually diagnose impetigo infection by examining the skin for these symptoms. Your doctor may take a sample of the fluid or crust from the blisters, and send this off to the lab to identify the type of bacteria causing the infection. The treatment depends on the type and the extent of the infection. Impetigo will usually heal by itself within 2 to 3 weeks, but treatment can relieve symptoms and shorten the length of the condition. Mix half a cup of white vinegar in a liter of lukewarm water. Soak a clean cloth in this liquid, and then apply this cloth to any moist or crusted areas several times a day for about 10 minutes. At the end, gently wipe off any crusts that have fallen off the skin. A mixture of half tea tree oil and half jojoba oil can be used to heal the sores and stop them spreading. Olive oil, manuka honey, buriti and rosehip seed are also useful natural treatment, and will help to prevent the scarring that often develops after infection. Other remedies that alleviate impetigo and promote skin healing include lavender oil, eucalyptus oil, Ravensara, lemongrass, and Helichrysum. Apply antiseptic (containing ingredients such as povidone iodine, hydrogen peroxide, and chlorhexidine) or antibiotic (containing fusidic acid, mupirocin, or retapamulin) ointment 2-3 times daily to the affected skin and the surrounding area. Continue this treatment until the skin has completely healed - look for any new lesions appearing. Oral antibiotics may be considered if the infection persists or returns even after topical treatment. 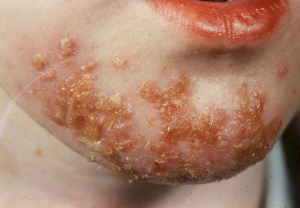 Impetigo is usually treated with flucloxacillin, a penicillin-type antibiotic. This treatment usually lasts about 7 days; remember to take the entire course of drugs to prevent the development of antibiotic resistance. Take an extended course of oral antibiotics. Use antibiotic cream around the nostrils three times a day for a week. Wash the skin every day using antibacterial soap or cleanser. Take a bath containing a small amount of bleach. If possible, try to identify the source of the infection, i.e. another impetigo patient or a carrier, and avoid contact with this person. Although impetigo is not considered a serious ailment, it is very contagious. As it is a skin infection, impetigo is easy to notice, which can cause some distress or embarrassment. However, sores can develop even on clean skin, and does not indicate poor hygiene or bad parenting. Cover the affected regions, particularly if your child is scratching the skin. Practice regular hand-washing for everyone in the household, and throw away used dressings and tissues. Wash cuts and grazes thoroughly. Take daily baths or showers with soap. Antibacterial soaps can help, but may cause irritation in some patients. Limit contact with other people; your child will have to stay off school until all the crusts have dried out. Wear freshly laundered clothes every day. Have separate towels and wash cloths for the impetigo patient, and wash all their clothes, towels and bed linen separately from those of the rest of the family. Use hot water for the wash, and dry the clothes in the sun or in a hot tumble dryer. Wash the child’s toys using weak disinfectant. Continue giving your child treatment until all the sores are healed. Make sure you remove the crusts from the sores, even if your child is receiving antibiotics. Remember that school sores are very contagious and are easily spread among children, so keep your child away from school for the first 24 hours after you notice symptoms. He or she can return to school after the first day, as long as all the sores are covered with dressings. If any of the following symptoms appear, make an appointment with your doctor: the development of fever or other illness, worsening symptoms or spreading lesions, even following treatment; and anything else that causes you concern.